Look for some tricky driving conditions on Tuesday, with snow and mixed precipitation in the forecast. 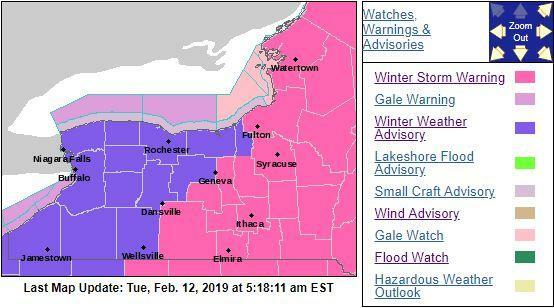 There is a Winter Weather Advisory for several counties including Monroe, Wayne, Livingston and Ontario into Tuesday night; there is a Winter Storm Warning for counties to the east and south, including Seneca, Steuben and Yates. Those areas could see high snow accumulations of 5 to 9 inches. News 8 meteorologist Josh Nichols says snow began Tuesday morning and will change to sleet by early afternoon with some freezing rain later in the afternoon. Total snowfall will be around 3 to 6 inches before changing to rain. The high temperature will be in the low 30s, and then rise toward 36 later at night. There were a number of accidents reported around the region as well, with a travel advisory issued in Livingston County. Several flights at the Greater Rochester International Airport were delayed or canceled. The Rochester City School District canceled all afterschool and evening activities on Tuesday; and 2 public meetings at schools in receivership were canceled, and re-scheduled for Wednesday. After a bit of rain early Tuesday night, Nichols says look for colder temperatures, with a low of 27, and Wednesday’s forecast calls for cloudy, windy and cold weather, with some lake snow and a high falling back into the 20s. There is a Wind Advisory in effect for most of Wednesday for counties including Monroe, Genesee, Orleans and Wyoming with gusts up to 50mph possible. Later in the week, temperatures will rise, getting up to 44 on Friday before falling back over the weekend.